What we now call the Internet - a vast and interconnected realm of data - finds its roots in local area networks. The first of these emerged in 1977 and was put to use at a Chase Manhattan Bank. A network that enabled inter-computer communication within a small area, ARCNet (short for Attached Resource Computer network) had the capacity to link up 255 computing devices. From its humble beginnings operating at a single New York bank, the system fundamentally shaped the course of information sharing between devices. The early 1990s was a time of transformation for both computing and data centers. This period saw a surge in Internet use. Suddenly, the Web became a common point of access for users across the world, and all that web computing began generating data. 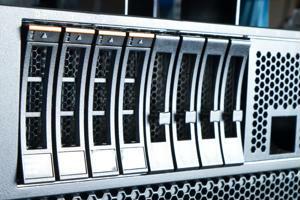 With the influx of data came the need to identify storage solutions. Businesses started to build up data centers started to handle their emerging information storage needs. Yet these centers lacked the sophistication they have today. In fact, Google's first data "center" - launched in 1998 - could not be called much more than a cage, measuring merely 7 feet by 4 feet with a capacity for 30 PCs on its shelves, PC Magazine reported. Considering the closet-like nature of the center, it is a safe bet that the data room cooling system the company used wasn't nearly as innovative as its current methods, which include using seawater as a means of maintaining optimal data center temperature, according to Google. In the computing sphere, 2006 seems like the distant past. And yet that year represented an important advancement with regard to data mobility. It was the year that Sun Microsystems launched their "data center in a box" - a highly compact data storage system that was perfect for data-driven projects that needed to come together quickly. Because its design was centered around a 20-foot shipping container, these data boxes were made to be transferable, The New York Times reported. This proved an expeditious solution for operations such as oil rigs, which could now house their data at the site of the business. In order to maintain a workable server room temperature, the system relied on a spot cooling method that applied chilled air to hot areas. Hearing about a data center that keeps cool with water from a Gulf or calls its home the inside of a mountain might have seemed like science fiction to a 1990s audience. But such advancements are simply par for the course is an age when data centers are growing alongside the information they store. Google has emerged as a front-runner in such innovations. It oversees a vast worldwide network of data centers, each with its own distinguishing features. Its facility in Berkeley County, S.C., for example, relies on data room cooling from a 240,000 gallon storage tank. Meanwhile, its center in Douglas County, Ga., is equipped with highly pressurized water pipes specially designed to unleash their contents in case of a fire. Across the world there are many other data centers that work to make the process of data maintenance more efficient.